Southern Ocean pirates: what’s in a name? you don’t need a peg leg or an eye patch…When you ram ships, hurl glass containers of acid, drag metal-reinforced ropes in the water to damage propellers and rudders, launch smoke bombs and flares with hooks, and point high-powered lasers at other ships, you are, without a doubt, a pirate. No matter how high-minded you believe your purpose to be. We conclude that “private ends” include those pursued on personal, moral or philosophical grounds, such as Sea Shepherd’s professed environmental goals. That the perpetrators believe themselves to be serving the public good does not render their ends public. ..The activities that Cetacean alleges Sea Shepherd has engaged in are clear instances of violent acts for private ends, the very embodiment of piracy. It’s a big legal call for a court to describe the Sea Shepherd activists as pirates. Pirates can be prosecuted by any state, even where there’s no connection between that state and the pirates, the pirates’ vessel or their victims. The international law of the sea permits any state to seize a pirate ship on the high seas. So Sea Shepherd vessels could, by virtue of this line of argument, be boarded by any state in international waters. And its crew could be prosecuted in any jurisdiction. But international legality aside, there are real maritime safety and environmental issues at stake. Admiral James Goldrick was in charge of Australia’s Border Protection Command four years ago. At that time, he deployed a Customs ship to monitor Japanese whaling operations so he’s seen Sea Shepherd’s activities up close. He’s rightly expressed concern  that Sea Shepherd’s actions will cause injury or loss of life, as well as risking ships being damaged or sunk, which might create significant environmental hazards. Debris from Sea Shepherd’s activities is scattered around the Southern Ocean. ‘Fuel spilled from a damaged tanker (and such a vessel was one of the ships involved in the latest encounter) could wreak havoc’, Admiral Goldrick has pointed out . Harassment by the Sea Shepherd won’t change Japan’s position on whaling. Access to a port of a state is a privilege, not a right. It’s an offence for a whaling vessel, for example, to call at an Australian port, unless the master has written permission from the environment minister to bring it into the port. 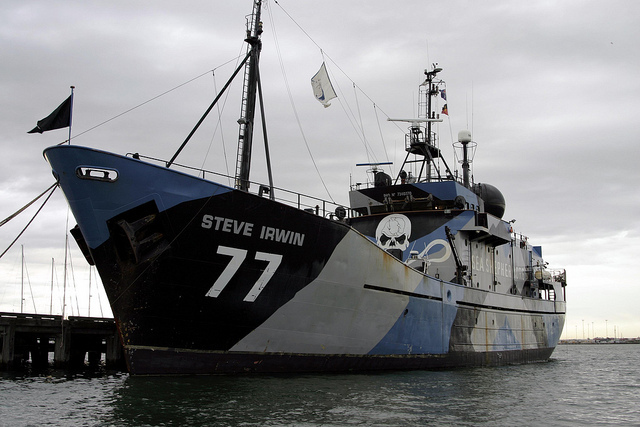 If the Australian government continues to let the Sea Shepherd group (which have now been deemed by a properly constituted court as pirates) use Australian port facilities, it will in effect be sending a message that it’s prepared to countenance dangerous behaviour and be selective in its application of the law of the sea. Anthony Bergin is deputy director of ASPI. Image courtesy of flickr user Wally on water .